Awww, such a cut little saying for someone who is stuck in an experience they would rather not be in. 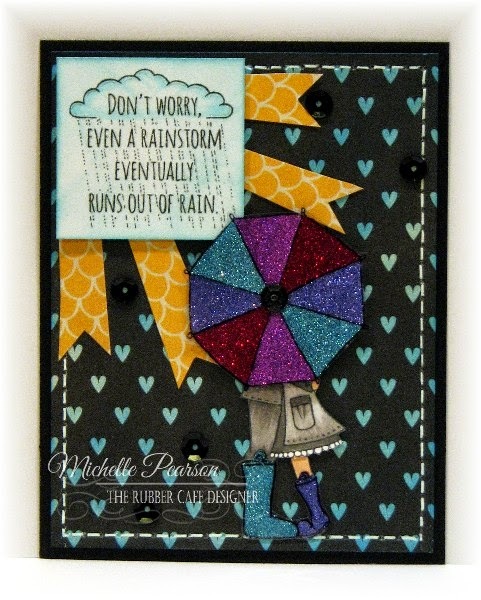 This card uses goodies from The Rubber Cafe's January Kit of the Month. I used the Glitter and Acetate Technique (mini tutorial here) with a rainbow of pretty You're So Fine Glitters: Diva Pink, Lilac Purple, Blue Skies and Purple Rocks. I stamped the umbrella and boots with Stazon on the acetate provided in the kit. I cut them out after the glitter had dried and then applied them to my Copic colored image with a touch of Scrap Happy Sheer Glue for the boots and Kool Tak Foam Tape for the umbrella. For my background I applied Salty Ocean Distress Ink to the hearts for a raindrop effect. I then cut some banner pieces from the yellow designer paper for my sun rays that are peeking out from behind my cloud/sentiment image. I accented the cloud image with some Sakura Stardust Pen from a prior kit. My final touch was some faux stitching with a white gel pen and then some sequins from the kit.